I’m already a huge fan of Marc Jacobs Dot and Marc Jacobs Honey, and of course Marc Jacobs Daisy, so when I heard about the new scent, Daisy Dream, I got really excited! 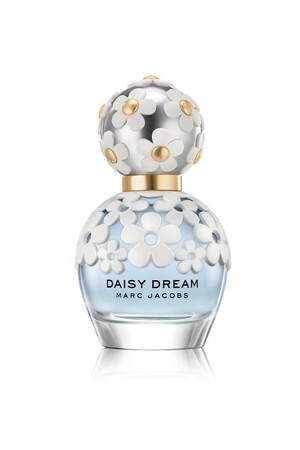 Marc Jacobs Daisy Dream is a bright floral and fruity scent that is super feminine and delicate. It isn’t too strong and it has some really great notes within the scent. Below is the description of Daisy Dream. I can definitely detect the grapefruit and pear top notes and the jasmine heart notes. The white woods, musks, and coconut water base note leaves a lasting scent that is gentle and pleasing. I continually asked my boyfriend for his opinion on this scent throughout the day and he genuinely liked it. He even notice the difference from when I originally sprayed it to a few hours later when it had dried down a little. Overall this is such a lovely and girly scent that I will be reaching for again and again. It’s soft for summer but I can see myself wearing it in the Fall to bring back some light summer memories and wake up in the colder weather.